There are many fiberglass resins available and each has unique characteristics. You’ll want to discuss specific applications and operating conditions with a resin supplier and or the engineer and design services team you’ve selected to work with on your FRP project. This will help to ensure that your resin selection is appropriate and in concert with your service needs and specifications. Similarly, the engineers you work with may want to view detailed chemical resistance resin data when making critical design considerations. You can typically find this data in a resin manufactures selection guide. Provided below is some basic information that pertains to common resins used when designing FRP products for a wide range of industrial and commercial applications. Polyester Resins are thermoset polyesters. They are versatile, offer good dimensional stability and have good mechanical, chemical-resistance and electrical properties. Vinyl Ester Resins are flexible (double bonded vinyl group) in nature and are useful when creating products that are designed to withstand flexing, impacts or compression. Epoxy Resins have an extended range of properties when compared to polyester and vinyl ester resins. They demonstrate extremely low shrinkage, good dimensional stability, high temperature resistance, as well as good fatigue and adherence to reinforcements. In addition, they have excellent resistance to basic (alkali) environments/solutions. Generally speaking, epoxies require heat curing to develop higher heat distortion temperatures. Polyurethane Resins are known throughout the fiberglass industry for their durability and robustness. They are flexible in nature and can be used in a wide variety of applications. Phenolic Resins posses many desirable attributes in the fiberglass world. They offer formability to complex contours, as well as flexibility. They are heat and chemical resistant and demonstrate flame retardance. They are ideal for high temperature applications where parts/components must meet fire safety, smoke emission, and combustion and toxicity requirements. In addition, they also have electrical non-conductivity characteristics. Hybrid Resins are unique in that they are a customized blend of various resins and fillers to create superior properties that allow you to optimize your design and product. For fiberglass products to perform right in the field, it takes more than just quality manufacturing and resin selection. It takes a high level of engineering and design skills with project related expertise – the kind that comes from years of experience. Beetle Plastic’s engineers have the experience, skills and the knowledge, to help you with virtually any project related to fiberglass and FRP applications. When a customer came to us with an existing metal and wood scaffolding maintenance platform that needed to be replaced with a permanent material solution, we said no problem! To see how we used custom pultruded FRP to solve our customers maintenance platform problem, download the full case study here or by following the link below. There are many important properties of Fiber Reinforced Polymers (FRP) that are determined by international testing methods. These measurements of properties are particularly useful for quality control and specifications purposes. Flexural Modulus is an engineering measurement which determines how much a sample will bend when a given load is applied, as compared to Tensile Modulus which determined how much a sample will stretch when a given load is applied and Compressive Modulus which determines how much a sample will compress when a given load is applied. Because composites are non-isotropic(as opposed to metals for example) these additional material properties are required in order to predict the behavior under load which complicates the design problem for the inexperienced. ASTM D-790 is one such standard testing method that is used to determine flexural properties of FRP. According to ASTM D-790, flexural properties may vary with specimen depth, temperature, atmospheric conditions, and the difference in rate of straining. For example, because the physical properties of many materials (especially thermoplastics) can vary depending on ambient temperature, it is sometimes appropriate to test materials at temperatures that simulate the intended end user environment. Another common standard for testing flexural behavior is ISO 178. Similarly, this standard specifies a method for determining the flexural properties of rigid and semi-rigid plastics under defined conditions. A standard test specimen is defined, but parameters are included for alternative specimen sizes for use where appropriate. It is important to note the differences between ASTM D-790 and ISO 178 standards. According to one well established leader in plastics testing, most commonly the specimen lies on a support span and the load is applied to the center by the loading nose producing three point bending at a specified rate. These parameters are based on the test specimen thickness and are defined differently by ASTM and ISO. For ASTM D790, the test is stopped when the specimen reaches 5% deflection or the specimen breaks before 5%. For ISO 178, the test is stopped when the specimen breaks. Of the specimen does not break, the test is continued as far as possible and the stress at 3.5% (conventional deflection) is reported. This article was aimed at providing a snapshot portrait of the standard testing methods used for determining flexural properties of FRP. Fiber Reinforced Polymers (FRP) are unique composite materials in many respects. For starters, they can be formulated to be corrosion, abrasion, and UV resistant, as well as, smoke and fire retardant. FRP are often a cost-effective choice in many industrial applications; they have long life cycles and have demonstrated durability in stringent environments with reduced maintenance costs. Here are five reasons FRP stand out when compared to metals and metal alloys. High Strength-to-Weight Ratio– FRP are lightweight and strong; they posses a vast range of mechanical properties, including tensile, flexural, impact and compressive strengths. When compared to most other metals they can deliver more strength per unit of weight then most metals. Their light weight also lends itself well to logistics—it’s easier to ship and install. Customizable- Every industry has unique problems to solve. With FRP engineers have the ability to tailor or modify the design of their FRP to meet their specific requirements. For example, consider the benefits of altering resin, glass content to optimize your corrosion and or abrasion resistance—you can’t do this with metal. Anisotropic- Engineers can maximize the performance and efficiency of the structure when they take advantage of the inherent anisotropic properties of FRP. Because the maximum strength is in the direction of the fiber reinforcements engineers can optimize the design to optimize the materials and the overall performance of the structure. High Tensile Strength with Low Modulus of Elasticity-FRP have high tensile strength due to its composite properties. Engineers can specify unique resin, fiber-reinforcement compositions when working with FRP manufactures. The design control inherent to FRP will enhance performance and can only be realized when working with composites, not metals. Ability to Form Complex Shapes- Engineers can harness ultimate design flexibility when using FRP—an advantage over traditional materials such as metal, concrete, and wood. When you integrate FRP design into your project into your project also consider the added benefits of part consolidation, noise reduction and streamlined design. There are many other reasons one should consider using FRP. For example, they offer high dialectical strength, thermal cycling, dimensional stability, impact resistance, low coefficient of friction, and do not require cathodic protection—just to name a few. The real gem of FRP is that they are customizable and can be designed and modified to meet almost any chemical/physical requirement. This is primarily why FRP have been chosen by so many industries as the material for corrosion resistance applications—where other materials fail, FRP thrives. With so many benefits, it’s no wonder that FRP are viewed by so many as a cost-effective alternative to conventional materials. There are many advantages to using Fiber Reinforced Polymers (FRP); high strength-to-weight ratio, dimensional stability, long service life, and reduced maintenance cost—to name a few. FRP can also be formulated with enhanced properties such as corrosion and abrasion resistance and smoke and flame retardance. In many stringent industrial applications, including copper recovery, where other materials fall short FRP has the ability to endure, thrive, and perform. FRP is commonly used as a cost-effective material solution because it can be formulated to withstand strong acids, bases, and organic compounds. Moreover, FRP is recognized as having superior corrosion resistance, when compared to specialty alloy metals, in aggressive hydrometallurgical and chemical process environments. The copper recovery process is dynamic and has been simplified over time with the development of chemical processes and other technological advances. In copper recovery systems many of the chemicals/compounds that are used are hazardous and highly corrosive. For this reason, careful planning and thought must go into what building materials are selected for facilities. FRP has evolved in concert with the ever-changing metal and extraction industry and is now poised to fill many material niches. In the copper recovery process copper is leached from ore with sulphuric acid and is easily recovered in a pure metallic form by the well known process of solvent extraction. At the center of the process is the copper recovery reagent that is used to selectively extract copper from the aqueous leach solution. In general terms, the copper recovery process can be broken down into three basic steps: leaching (sulfuric acid), solvent extraction, and stripping (high acidity coppers sulfate electrolytes). Beyond these three steps, the process of copper recovery has many areas where FRP products can be used; for example, transportation, storage, and general infrastructure needs. 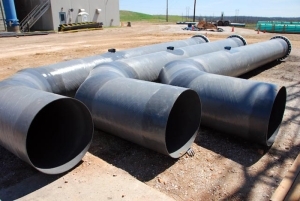 FRP offers design flexibility; in metal extraction and refining industries it can be used for pipes, ductwork, tanks, solvent extraction vessels absorption towers, basins, floor coverings, grating, and electrowinning tankhouses— just to name a few. 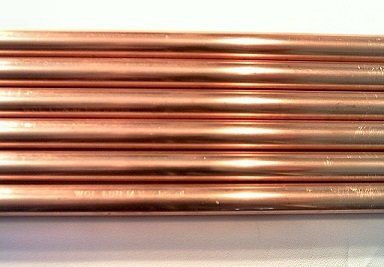 Case in point, FRP grating has been successfully used as a walkway/platform material in copper recovery systems around vats in the electrowinning process. Whether you’re handling corrosive compounds such as sulfuric acid or high acidity extractants and stripping agents, FRP will withstand the harshest environments and is a corrosion resistant, cost-effective choice. In the metal and extractions industry FRP has a distinct advantage over metal alloys, including titanium, and rubber-lined steel with lower installation costs, reduced maintenance, and long service life proven with over 20 yrs of successful operating experience at many plants/facilities around the world. Sustainability is big word these days. It can mean a lot of different things, depending on the context—it can also be overused or misunderstood. 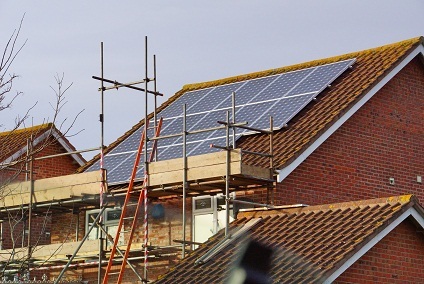 In recent years the demand for more green construction or sustainable construction has been driven largely by consumers in the construction sector. In this context, sustainable construction aims at reducing the environmental impact of a building of its entire lifetime, while optimizing its economic viability. The benefits of green construction are many; lower operating costs, increased asset value, reduced waste sent to landfills, conservation of energy and water, and reduced greenhouse gas emissions, for example. That’s all fine and well—but have you ever stopped to think how Fiber Reinforced Polymers fit into this equation? Currently, Fiber Reinforced Polymer (FRP) products are a cost-effective material choice in many green construction circumstances. Furthermore, as their international recognition and reputation as an ecologically sustainable product continues to grow, so do the uses and applications. For FRP manufactures this is good news. The LEED Program (Leadership in Energy and Environmental Design) was developed by the U.S. Green Building Council to provide a framework for implementing practical and measurable green building solutions. The LEED green building rating system is the internationally accepted benchmark for the design, construction and operation of green buildings. Voluntary participation in the program by builders demonstrates initiative to develop high performance sustainable buildings with energy savings, lower carbon footprints, and environmental responsibility. FRP products are gaining more attention as a LEED recognized, or certifiable environmentally sustainable building material. For example FRP products can now qualify for many credits under the LEED building rating system such as Energy Performance, Regional Materials, and Heat Island Effect—to name a few. When composites are compared to other traditional materials such as concrete, wood or terra cotta, the total life-cycle assessment of fiberglass contributes to its viability as a green building product. When consideration is taken for the energy consumed in production, installation and environmental sustainability, fiberglass products generate a much smaller impact than other traditional materials and can be used in ways that are less energy or carbon intensive. One of the key attributes of composites, which makes it a LEED recognized green material, is its thermal integrity—minimizes heat loss during winter and heat gain during summer. FRP architectural components are highly desirable for their design flexibility, high strength-to weight ratio, cost-effectiveness, flame retardance, and overall durability. Added to the list now is the potential for internationally recognized LEED credits. For example, as a builder you can achieve credits (on path to certification) for using locally or regionally sourced materials, innovative design, and moisture management components (e.g. our fiberglass products are impervious to water, and will not rot or swell) —among much else. There are many categories, classifications, credentials, prerequisites, and credits to understand for the voluntary LEED Certification and the onus is always on the builder. With single-source design-build capabilities we can help you. We offer a wide variety of custom composite products/components for a wide range of architectural applications and green construction projects. Contact us. Combustion/fire is a serious concern regardless of the industry. 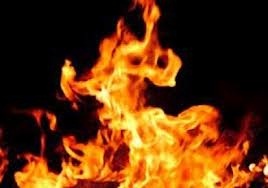 Fire resistant composites are essential for numerous applications including construction materials, structural heat resistant barriers, fire proofing, and generally speaking, improved thermal stability. One remarkable advantage of using custom Fiberglass Reinforced Polymers (FRP) is that they can be designed, formulated and manufactured per your requirements. When discussing combustion, heat, or fire resistance, in terms of FRP, it is important to consider composition of laminates, resins, and enhancements such as fillers, additives, and modifiers. In some cases, resins matrices may be enhanced with the addition of fillers, additives and modifiers to demonstrate improved heat resistance. There are specially filled resins which exhibit fire retardance features to insulate and protect structures from jet fires or extreme temperatures from nitro combustion (burning of film materials). Many of the enhanced qualities, such as heat resistance, are the result unique material formulations, for example, using fillers, additives and modifiers in the manufacturing process. Similarly, it has been demonstrated that stabilizers can help to mitigate the effects of prolonged exposure to heat, and are an essential ingredient when creating durable heat resistant FRP. Included in this category are materials containing ATH (alumina trihydrate), bromine, chlorine, borate, and phosphorus. The filler alumina tri-hydrate is frequently used in this application because it gives off water when exposed to high temperatures thereby reducing flame spread and development of smoke. Another common hydration filler used for fire resistance throughout the fiberglass industry is calcium sulfate. Simply put, heat stabilizers are additives that protect or reduce the effects of heat or radiation on plastics or polymers. In some cases, heat stabilizers are used in thermoplastic systems to inhibit polymer degradation that results from exposure to heat. The effectiveness of the stabilizers against weathering (heat degradation, UV radiation etc.) depends on solubility, ability to stabilize in different polymer matrices, the distribution in matrices, and evaporation loss during processing and use. Heat stabilizers are mainly used for construction products made of polyvinyl chloride, for instance window profiles, pipes and cable ducts. However, it is also important in the manufacturing of FRP and the uses/applications are potentially limitless. With our composite expertise and precision manufacturing capabilities, we are prepared to help you with your high-temperature composite needs. But seriously, during a fire fiberglass reinforced plastic does create smoke. As we mentioned in a previous blog post, new regulations and code requirements regulating smoke toxicity have made smoke an important consideration, for some. Why Is Smoke A Concern? 1. Heavy dense smoke cannot only make breathing difficult, but can obscure the escape paths when people are trying to escape from a building during a fire. 2. Smoke toxicity, especially from organic materials, is also a critical safety consideration. Even if the smoke is very light, but is highly toxic, personal injuries can occur. Smoke toxicity is one of the reasons the New York City and New York State Fire Marshals have now added to their code requirement consideration for low smoke toxicity. Is Smoke An Important Building Factor? Whether smoke is an important factor in your construction is really dependent on your unique requirements. 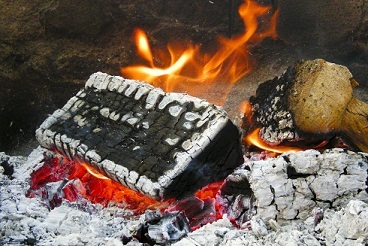 However, rather than deciding to spend a lot of time and energy trying to develop low smoke alternative, you really should try to determine if low smoke is really important in your service environment. If your tank, piping, or duct application is mostly outdoors in an industrial location, then perhaps smoke is of only minor importance. In cases where this is the case, if you are going to have a major plant fire, the smoke generated probably is the least of anyone’s worries. Likewise, in many service installations where there is low “people occupancy”, such as water and waste treatment facilities, composting facilities, warehousing buildings, etc., then again, low smoke is perhaps only of secondary importance. Deciding whether fire retardancy (low flame spread), smoke generation, or smoke toxicity are even important or necessary for your application should be your first step in determining if smoke is an important building factor. These features are going to cost you extra money. If they are not required, do not specify them. Well over 90% of all FRP composite pipe and duct installed to date is not fire retardant and does not provide low smoke generation and low smoke toxicity properties. When choosing and specifying the materials for your system, consider the cost of the materials, installation and, most importantly, long-term operating costs. Installation of a Factory Mutual approved system may provide lower insurance rates. However, such a system may also cost more in materials and labor, and may require replacement or repairs in half the time when compared to a properly constructed dual laminate system. If smoke generation, smoke toxicity and smoke resistance are important to your project, then we recommend that you select the internal barrier/liner of your duct or pipe based upon the best resin matrix for your service environment. The term FRP, which is common throughout the industry, refers to plastic that has been reinforced with glass fibers. Fiberglass reinforced plastics (FRP) are used for many varied applications; from boats and bathtubs to missiles. 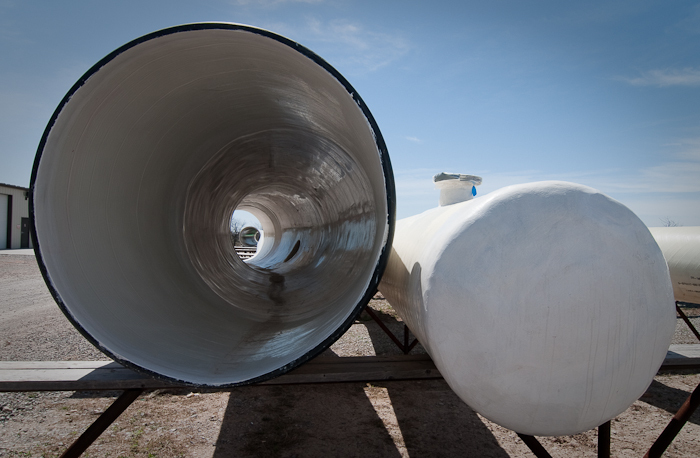 However, examples of equipment currently fabricated out of fiberglass-reinforced plastics include FRP tanks and vessels, FRP pipe, FRP ductwork hoods, fans, scrubbers, stacks, grating, and specialty fabrications. One of the fastest growing areas is the use of FRP for pollution-control equipment. What Can Be Used to Reinforce the Plastic? Many reinforcements can be used for plastic materials-including polyester fibers, carbon fibers and, of course, glass fibers. For corrosion-resistant equipment, approximately 95% of the applications normally involve the use of glass fibers (with some polyester fibers being used on certain specific occasions.). What Resins Are Typically Used? Glass fibers can be added to virtually all of the thermosplastic and thermoset resins, For corrosion resistant equipment, the resins used are primarily those of the thermosetting type. These are resins that, once they have “hardened,” remain in their cured configuration when subjected to heat-up to their distortion temperature or the temperature at which they will degrade. Examples of thermoset resins include the epoxies, polyesters, vinyl-esters, and furan. There are other thermo- setting materials, but these four are used in the vast majority of applications for fiber-glass reinforced plastics. The term “polyester” is a generic one that refers to a wide range of materials. It can include everything from a general-purpose resin used in boats and bathtubs to the most exotic, high-temperature corrosion resins. For corrosion-resistant equipment, specialized corrosion-resistant-grade resins are available. A number of companies manufacture isophthalic polyester resins, which have a distinct place in the hierarchy of corrosion-resistant materials. Very frequently, to reduce costs, a customer will have equipment built with one of the premium-grade resins used for the corrosion inner liner, the balance of the structural laminate being built with an isophthalic polyester resin. One type of corrosion-resistant resin in use is the vinylester resin. The vinyl-esters are similar in corrosion resistance to the bisphenol A polyester resins, but for many applications, possess improved physical properties, especially impact and toughness. The original vinyl-ester resin from Dow was known as Derakane 411. This is a very good resin up to 180°F, but the physical properties fall off very rapidly past that point. Several years ago, Dow introduced Derakane 470 resin, with improved high-temperature properties and improved solvent resistance. Another addition from Dow has been Derakane 510, a fire-retardant vinyl-ester resin. This resin achieves its fire-retardancy without use of such materials as antimony trioxide. What Do You Need to Know About FRP and Fires? While the fiberglass reinforcements used in corrosion resistant laminates will not burn, most thermoset resins used as the matrix for “FRP” laminates will support combustion. Even the “fire retardant” resins will burn vigorously when fire is supported by an outside source. The rate of flame spread is somewhat lower for these fire retardant resins. Fire retardant thermoset resins typically contain halogens or bromine molecules. When combustion occurs, these additives suppress or smother the flame and the laminate becomes self-extinguishing. When the more common thermoset resins (polyesters, epoxies, vinyl esters, etc.) used for fiberglass reinforced plastic composites burn, large amounts of heavy, black, dense smoke can be generated. The carbon chains in these resins contribute to that smoke. There is no difference in the density of the smoke generated between a non-fire retardant resin and a fire retardant resin. The only difference is that the amount of smoke may be less when fire retardant resins are used, and the fire is not supported by an external source. Although some facilities can experience more damage from the smoke rather than the actual fire, such as in electronics plants, for most facilities the fire itself, and the damage it can cause, is of far greater concern than smoke. As one plant engineer of a major chemical plant told us one time, “When we have a fire in a chemical plant, we are allowed to have smoke.” In those cases of typically wide-open spaces, or facilities with low occupancy, the smoke generated is the least of the problems when a chemical plant or refinery catches on fire. How Much Smoke Will Be Generated? ASTM E-84 test results for polyesters, vinyl esters, and epoxies typically yield smoke generation values in excess of “750”. It can be said unequivocally that if FRP composite pipe and FRP ductwork is exposed to a “raging fire”, there will be a lot of smoke generated. The ASTM test can only provide a hint of how much smoke. Inquiries to all of the major manufacturers of resin systems used for corrosion resistant applications have solicited written responses that they have no, and know of no, polyester and vinyl ester thermoset resin systems that will generate, by themselves, smoke generation values under 350. If you are going to be specifying flame spread and smoke generation levels, we recommend that you consult with either a knowledgeable fabricator, or one of the resin manufacturers.